I understand Amos is not a stats software. NOTE: This is SPSS Amos. Amos is NOT a statistics package, rather it for structural equation modeling (SEM). 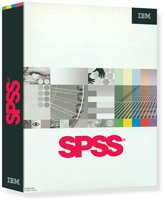 Make sure this is the SPSS product you need. If you need more functionality, you will want to consider one of the other SPSS products. If you are unsure which SPSS product you need, check with your instructor. This SPSS product is for Windows only. IBM SPSS Amos gives you the power to easily perform structural equation modeling (SEM) to build models with more accuracy than standard multivariate statistics techniques. Psychology - Develop models to understand how drug, clinical, and art therapies affect mood.Medical and healthcare research - Confirm which of three variables -confidence, savings, or research - best predicts a doctor's support for prescribing generic drugs. Medical and healthcare research - Confirm which of three variables -confidence, savings, or research - best predicts a doctor’s support for prescribing generic drugs. Social sciences - Study how socioeconomic status, organizational membership, and other determinants influence differences in voting behavior and political engagement. Educational research - Evaluate training program outcomes to determine impact on classroom effectiveness. Market research - Model how customer behavior impacts new product sales or analyze customer satisfaction and brand loyalty. Institutional research - Study how work-related issues affect job satisfaction. Business planning - Create econometric and financial models and analyze factors affecting workplace job attainment. Program evaluation - Evaluate program outcomes or behavioral models using SEM to replace traditional stepwise regression.